The complete laser engraving system built specifically for the mold making industry. Finally there is a laser engraving solution developed specifically for the needs of the mold making professional. Laser marking is widely employed on large scale for part identification and traceability. Lasers mark a wide race of materials that include metals, nonmetals, ceramics, plastics, organics and semiconductors, just to name a few. Laser engraving is the fastest and most flexible method used to mark alphanumeric, graphic, logos, barcodes, and even images. Anneal marking, engraving, soft marking are some techniques used to achieve desired marking results. The good absorption properties of most materials at near IR wavelengths make fiber lasers very attractive for laser marking applications. The beam quality, compact design, and maintenance free operation are of particular interest. Most tool steels including: Beryllium, Aluminum, Gold, Silver, Titanium, etc. Because of the 100% solid state design our laser boasts an electrical efficiency of up to 15X greater than old lamp pump systems which translates into significant cost savings for the user. No lamp, mirrors or other expensive consumables to replace. This can represent a significant cost savings over the lifetime of a typical laser engraving system. Highly efficient design allows for a laser which is air cooled. No requirement for an external water cooling system. State of the art laser technology allows for a beam quality to which surpasses that of a conventional lamp and diode pumped laser engravers. This translates into a high performance tool for all of your engraving and marking applications. 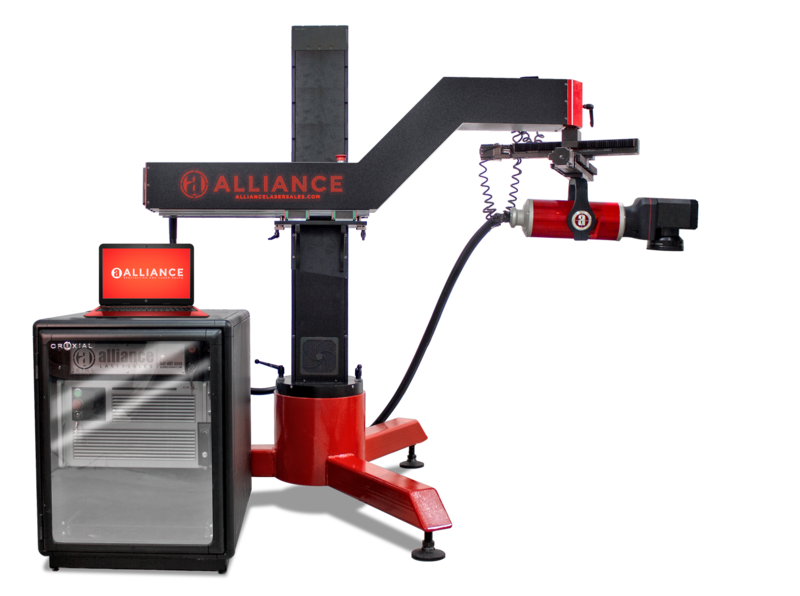 The small spot size of the Alliance ID1-NGRV gives the user the ability to set new standards for minimal readable characters and graphic reproductions.